According to the Federal Reserve, at least 167 million Americans carry at least one credit card. I like to use credit cards as a tool to help improve my credit score but honestly, I love receiving rewards as well. It’s fun to earn points and cash back for simply spending money as I normally do each month. I understand that credit cards aren’t for everyone especially if you are prone to overspending and not paying your bills on time. On the flip side, if you enjoy making purchases with credit cards and have been using them wisely you may want to consider cashing in some of your rewards for the holidays. Here are 5 ways to do it. Most rewards credit cards will allow you to redeem your points for gift cards at popular retailers. I have a Citi credit card that actually allows cardholders to buy discounted gift cards with points. As you can imagine, this can save you a ton of money this Christmas. You can order gift cards as holiday gifts for friends, family, and coworkers, or you can simply redeem a gift card for your own purchases. If you know you’ll be dining out with a friend who’s coming into town for the holiday, consider getting a gift card to one of your favorite restaurants to lower the bill. Planning any holiday trips? 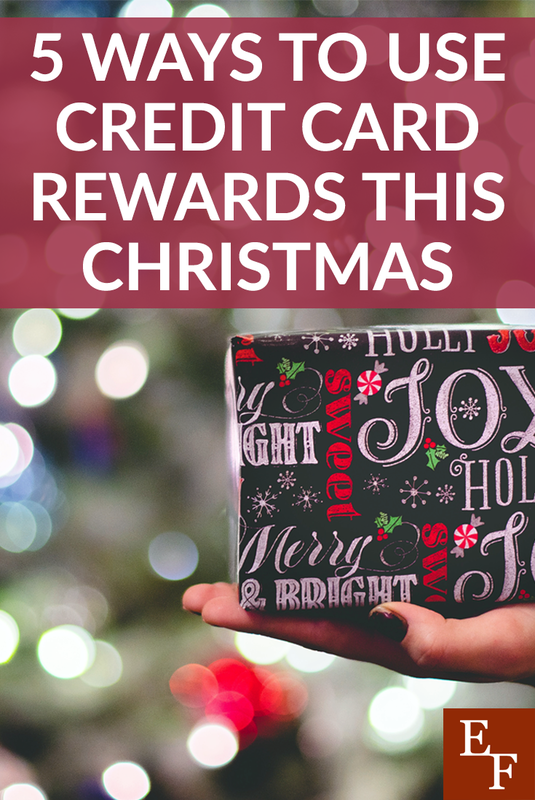 If you have family you want to visit or are just in the mood to travel somewhere warm for Christmas, you could redeem some of your credit card reward points for travel. Airlines like Southwest and American Airlines tend to have the best travel rewards deals and sign-on bonuses. If you’ve earned a big sign-on bonus or spend responsibly on your card all year-round, you may have enough points to score a free roundtrip flight. Credit card rewards can also be redeemed to cover the costs of your hotel stay. For my honeymoon, my husband and I booked an all-inclusive resort with credit card rewards. This not only covered our stay at the resort, but it also covered food, drinks, and on-site amenities and activities. Depending on how much rewards you have, you could even consider taking a loved one on an affordable trip with you as a Christmas gift. Rewards credit cards tend to offer excellent travel benefits in general as well. If you need discounts on travel insurance, a rental car, or access to a comfy airport lounge, check out the benefits of your credit card to see if you can take advantage of any of these offers. Some credit card companies have online shopping portals that allow you to buy discounted merchandise with your reward points or just your credit card. Since these shopping portals offer exclusive offers, this could be a great way to save money on holiday gifts for others without having to indulge in Black Friday or Cyber Monday shopping. The Citi Diamond Preferred credit card has an online shopping portal called Citi Easy Deals where you can shop online for merchandise like home and kitchen items, shoes, clothes, handbags, watches, sports apparel, electronics, and more. Two years ago, I was using their online portal to find a gift for my husband. He loves listening to music but some of the Bluetooth headphone sets are super expensive. Since I didn’t want to spend $200 on headphones, I checked the portal and found another brand offered Bluetooth headphones for just $40. I did some research on the company and read some reviews before deciding to purchase the headphones through Citi’s shopping portal. I saved a lot of money on the purchase and it was a pretty easy process to order the item online. Cash back rewards are some of the easiest credit card rewards to earn. Discover offers some of the best cash back rates but their cards require you to spend in certain categories each quarter in order to obtain them. A solid cash back card should offer 1% – 2% cash back on all purchases. This can really add up if you use your card for groceries, gas, and other regular spending. I currently have the Citi Double Cash Back card and use it to pay for groceries every month along with my phone bill. I’ve been collecting cash back that I plan to redeem as a bank transfer so I can use it for holiday shopping. If you have credit card reward points just sitting in your account, you can also see if you can use them as a statement credit to pay for your outstanding charges. This is one of the easiest ways to lower your monthly credit card bill and pay for holiday purchases you made with your card. I know America Express even allows you to make purchases on Amazon with your reward points. One day, I was ordering a book on Amazon and during checkout, I was asked if I wanted to pay for my purchase with American Express reward points. I said yes and signed in just to see what would happen. My point balance popped up and Amazon showed me how many points the book would be so I decided to pay with points instead of cash. Think outside the box this holiday season and don’t underestimate the importance of your credit card rewards. While you may have earned the rewards with the intention of using them yourself, you can also save a ton of money on Christmas gifts and experiences for others this holiday season. Do you plan to use credit card rewards for Christmas? How will you use them?